The space shuttle Endeavour soars high above Earth, which can be seen at the top of this view from a payload bay camera. 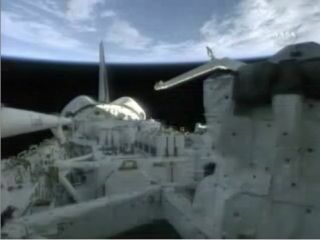 The shuttle's robotic arm is extended at right. The inspection boom for heat shield survey extends along the left side. The repeated launch delays for the space shuttle Endeavour werenot just frustrating, but expensive. NASA estimates every launch cancelled after fuel tanking hasbegun can cost as much as $1.2 million dollars. Endeavour enduredfive liftoff scrubs before successfully launching Wednesday at 6:03 p.m.(2203 GMT), though some of these cancellations occurred before ground crewsstarted loading propellant into the shuttle's external tank. The total pricetag for this mission's postponements, which began in mid-June and ended withyesterday?s liftoff, was less than $5 million, NASA spokesman Allard Beutelsaid. Though NASA tries to operate as cheaply as possible, safetycomes first, Beutel said. "Nobody wants to waste any money," he told SPACE.com. "But those decisions made to not launch were for safety reasons and notfor cost reasons. That has to win out. So the cost is not irrelevant, but it'snot the reason that you launch or don?t launch." Ultimately, the extra money spent getting Endeavour offthe ground is not a significant problem for NASA. "These costs are absorbed as part of the overallbudget," Beutel said. "We're not going to congress and asking formore money. There's always money to account for these kinds of things." The high price tag of ascuttled launch comes from the expense of personnel, as well as thesuper-chilled liquid hydrogen and liquid oxygen propellant. Though NASA canrecycle "the vast majority" of this fuel if a liftoff is cancelled,some boils away, Beutel said. NASA estimates that each scrub costs $500,000 in lost fuel,and $700,000 to pay for the extra workforce needed for launch attempts. Onthese occasions NASA personnel are deployed around the world, including atvarious transatlantic abort sites where the shuttle might land in case of anemergency. The exact bill varies with factors like fuel commodity prices andwhether the scrub took place on a weekday or a weekend. Endeavour?s seven-astronaut crew is flying a 16-dayconstruction mission to the International Space Station. The astronauts willswap out one member of the station?s six-man crew, deliver supplies and spareparts, and attach a large experiment porch to the exterior of the outpost?sJapanese-built Kibo lab. Five spacewalks are planned. Endeavour is due to arrive at the space station on Friday at1:55 p.m. EDT (1755 GMT).